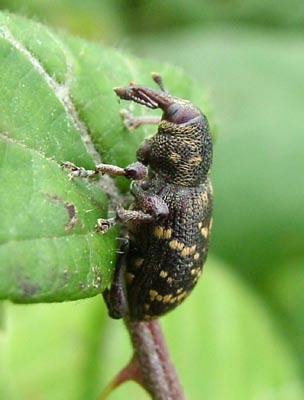 Two shots of the Pine Weevil - Hylobius abietis - It's a little off course on the Bramble, but Pines were only 50m. away. Hmm...according to references, this is quite a pest. At last the Angelica is bringing some rewards. 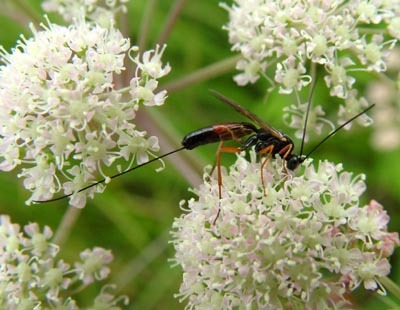 This beautiful female Ichneumon was nectaring on a newly opened flowerhead. And this tiny (3mm) Ichneumon was nectaring on Common Ragwort. Fantastic antennae. Another new micromoth VC record: This time for Catoptria margaritella. 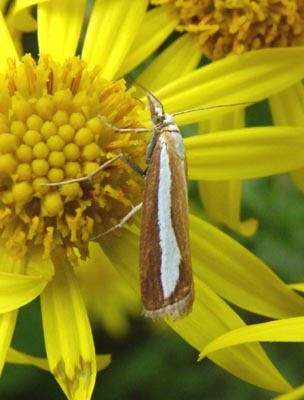 Some of these micromoths rival their larger counterparts in terms of colour and decoration. I thought this little (1 cm.) Hoverfly had yellow legs until I blew up the picture. It's busily trying to rub the pollen from its legs. Platychierus sp. The leaves of this Meadowsweet were covered with galls. This is one of the common Vespa wasps. I couldn't get a decent view of the face to attempt an id. It is, however, a male (the antennae are long and droop downwards).